With nearly twice as many women running for office in 2018 than in 2016, the results were groundbreaking. At least 98 women — 84 Democrats and 14 Republicans – were elected to the House of Representatives on November 6. For the first time ever, over 100 women will be serving in the next House. Thanks to these victories by women, Democrats have reclaimed the House, and next year the number of women in Congress will reach its highest level ever. This wave of female energy and anger, unleashed by the election of Donald Trump two years ago, also extends to the Senate, to statehouses and to races for governor. These women will change the face of our government. Instead of predominantly older white men, we will see young Native Americans, Muslims, Latinas, immigrants, millennials and LGBT politicians. Their campaigns were courageous, driven by a determination to thwart Trump’s message of fear and misogyny and to bring the U.S. back to a true democracy. Overall, the number of women in Congress will increase from roughly 20 percent to 22 percent. While that’s only a small percentage, but it’s a critical start. Here’s a look at 10 of the historic firsts that took place on November 6. 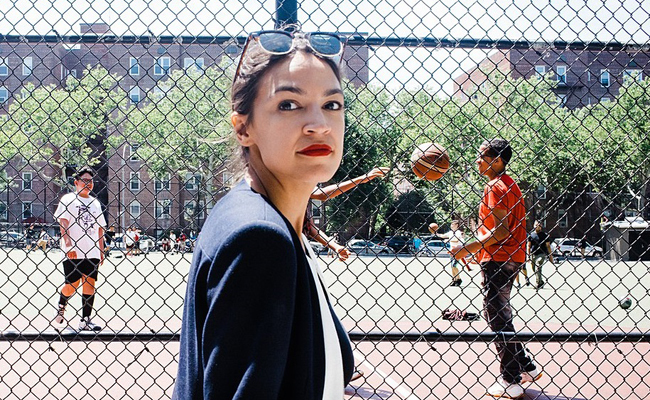 Alexandria Ocasio-Cortez, age 29, became the youngest woman ever elected to Congress, in New York’s 14th District. A Democrat, she unseated a 10-term congressman in the primary.Her campaign ad said, “Women like me aren’t supposed to run for office.” She ran an extraordinary race. Other young, first-time female candidates also proved successful. In Oklahoma, Kendra Horn defeated Republican Steven Russell, making her the first Democrat elected in her district in 44 years. In Iowa, Abby Finkenauer, another 29-year-old, defeated Republican Rob Blum. Finkenauer said she decided to run when Iowa Republicans voted to dismantle collective bargaining rights. The 2018 midterms saw the first Native American women elected to Congress. Democrat Sharice Davids defeated incumbent Republican Kevin Yoder in Kansas’ 3rd District. She is an attorney and a former mixed martial arts fighter, as well as the first lesbian congressperson from Kansas. Native American Deb Haaland won in New Mexico’s 1st District. She is a citizen of the Pueblo of Laguna tribe and an activist who has run on a platform of Medicare for All and the impeachment of Trump. In another historic first, Jahana Hayes, the 2016 National Teacher of the Year, defeated Republican Manny Santos — and became the first black woman from Connecticut to serve in Congress. As a teacher, I am especially proud of Hayes, who put education at the forefront of her campaign. Ayanna Pressley became the first African-American House member from Massachusetts. She was formerly the first back woman to serve on Boston’s city council before beating 10-term incumbent Michael Capuano in the primary in that state’s 7th District. Rashida Tlaib and Ilhan Omar will be the first Muslim women in Congress. Tlaib won her race in Michigan’s 17th district, becoming the first Palestinian-American woman ever in Congress. Ilhan Omar, a former refugee who is the first Somali-American to take a seat in Congress, has spent the last four years as a state legislator. And let’s not forget that Democrat Laura Kelly defeated Republican Kris Kobach and independent Greg Roman in the race for Kansas governor. Kobach, a major Trump supporter, was secretary of state, but his tenure was marked by legal battles over his registration laws. While we’re discussing woman power, consider all of the women who worked behind the scenes on these campaigns: postcard writing, phone banking, canvassing and donating. These historic firsts can lead us forward into a new age where we are no longer ruled by a racist, misogynist leader. Let’s move on!